Asbestos used to be a much sought after mineral because of its properties of insulation, resistance to fire and strength adding ability. 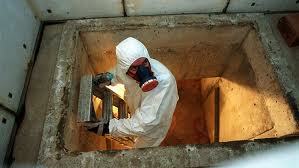 However, Asbestos is really harmful to the environment and hence, in 1977, the government banned it. But many buildings that were built before that time still continue to have Asbestos. This has a potential of causing severe environmental hazards if it gets released into the environment. Non Friable Asbestos – Floor tiles, shingles and asbestos cement are some examples of non-friable asbestos. This is comparatively safer as it is too strong to be crushed by hand. Hence, the chances of it releasing into the environment are much less. This is why they fall under low risk items. That being said, this means that you should be doubly careful of not crushing items made from asbestos. Friable Asbestos – Insulating materials use friable asbestos and before the 1977 ban, paints, patching compounds and textures also used this. This asbestos can be crushed into a fine powder and is hazardous in nature. 2. Removal Of Asbestos – This process can only be performed by trained workers and a lot of precaution needs to be taken before they start. Workers wear protective gear so that asbestos doesn’t enter their body. All the items of furniture are covered with a cloth or other protective fabric so that asbestos doesn’t settle on them during the process. Another thing to do is to wet the entire area surrounding it so that no debris are left in the air. You can also use High Efficiency Particulate Air vacuum cleaners to clean the area of asbestos debris after the process. All the material that the workers wear should be disposable after the removal process. Also, make sure that you conduct necessary air safety tests before people are allowed back in the area. 3. Disposal Of Asbestos –Unlike other minerals that you can easily dispose off in a simple bin hire, asbestos requires much more work.There are pretty stringent laws set by the government regarding the disposal of Asbestos and they must be followed carefully. The debris is packed securely in an air tight container by trained workers and later disposed into the nearest disposal facility that must be licensed. There are alternatives to disposal as well, in case you find the removal a bit too hard on the pocket. Instead of eliminating the asbestos tile, get it covered to prevent the harmful exposure. EPA has listed many such tricks that you could follow. Since asbestos is so dangerous to the environment, there are federal laws in place to govern asbestos handling, removal and disposal. A lot of paperwork and pre removal checks are performed to ensure safety. If you are a homeowner, the laws are much less strict for you but that doesn’t mean that you are exempt from them. Great information, as an owner of a local skip bin company we see many people not disposing of asbestos correctly and not even realising.